How does one access and integrate the vibration of Cosmic Kryst Consciousness? It is with great honour and pleasure to share that the frequencies of the Cosmic Kryst are even more accessible upon the Earth plane than ever before. In order to bring forth this level of accessibility, you are now invited to begin the path towards internal abundance to allow this to manifest through the reflections of your life. 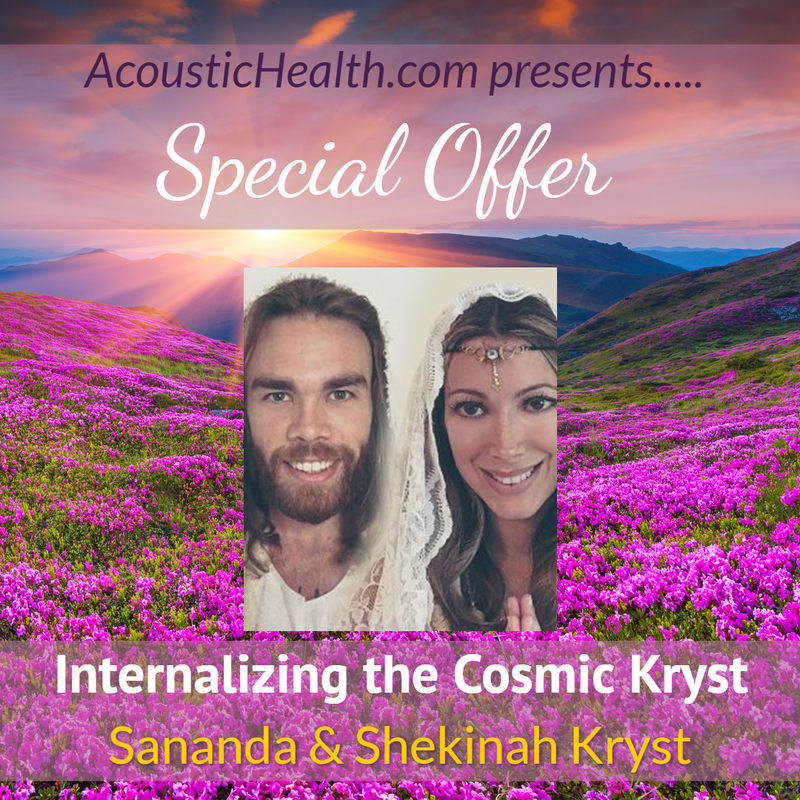 Through internal devotional practices that accelerate your spiritual liberation and ascension, you will learn how to bring these Kryst energies into your physical vessel, unlock supreme abundance and reclaim your birthright. The program will take the form of 4 wisdom pieces of training 4 energy transmissions that are available to watch and absorb anytime. The word Kryst is sourced from the first Primordial Sound tones of creation in this universe (Om Ka RA Ya Sa Ta). The concise form of the word Kryst holds a more ancient origin than the word Christ, as Christ stems from the Greek lexicon ‘Krystos/Christos’ meaning ‘Anointed’. Kryst is not a name it is a title given to the one whom has actualised this Ascended state of consciousness and has been ‘Anointed’ by the Internal alchemy that ignites the Eternal light of God within. The Cosmic Kryst manifests as the Divine Intelligence throughout the Unified Field of Source and is experienced/inperienced as Unity Consciousness. This field of infinite energy over-lights and sustains the entire multiverse through the Heavenly Presence of Unconditional Love. The Cosmic Kryst projects itself through the universal laws and sacred sciences governing all Source creation: also known as the Law of One. The Law of One is the Eternal Truth of the Kryst, and is the remembrance that Eternal truth is the Eternal Loving Presence of God within and throughout all. Once the natural rhythm of this Divine Presence is felt within you, life becomes effortless and ever flowing with grace and ease. Every breath you take, you become the witness of the entire universe breathing through you, as you. You only see life through the eye of Oneness and feel the interconnection of Unity consciousness of all that is. Every Soul is on a unique journey of Self-Realization to rediscover its ultimate truth and return to its Source. WE, the Divine Trinity at IODP, wish to support your journey by sharing illuminated practices that you can do daily to support your souls transformation. We will also go deeper into the virtues and values of what it means to live in alignment with the Law of One and how this will exalt your life and purpose beyond imagine. The internal path of Ascension is the spontaneous alchemy of Liberation. This golden pathway of complete spiritual sovereignty is humanities birthright and privilege. Liberation is the renunciation of the personal illusionary self (ego) and returning to the infinite supreme Self within. This can only transpire by the relinquishment of any attachments and desires that bound and limit the supreme self from becoming fully illuminated within. The Kingdom/Queendom of heaven is within you, as the Human body is the measurement of the universe and is a microcosmic reflection of the macrocosm itself. Every galaxy, solar system and astrologic constellation is a geometry and frequency animating your human hologram (body). The Human hologram is interconnected, interrelated and interdependent to every proportion of the cosmos and once liberated it is able to be at-one-ment with the full divinity of Source. It can take beings countless lifetimes to even find these rare sacred teachings, thus when found they become the crown jewels to life itself. Some of the most outspoken and asked about questions for the Dear Hearts on the planet are: What is my spiritual purpose? What am I doing here on Earth Plane? And how am I best to contribute in order to follow my Divine path? These questions are of course subjective in nature and do vary according to the soul’s monadic journey and what it is that each soul has chosen and contracted to experience. However, with all of that stated the most simplistic answer and most universal purpose is that you, beloved Earth Angels, are here to bring heaven to Earth and remember your divine nature through this biological process of alchemical transformation. How does one accomplish this? One creates this through the sanctification and purification of each and everybody vessel that is currently gracing you with life and animation. As we, the Nada/Sananda consciousness bring you through the steps, phases and life path required of deep inner communion, dedication and devotional service to the Cosmic Kryst within you, more will be revealed as to how to bring this into glorious manifestation and form. You will receive an introduction as to how it is “YOU who are the Light of the world and the door no man can close.” This, our darling hearts is the Ascension to liberation path and it happens within your sacred vessel first. Romeo, Romeo wherefore art thou Romeo? This iconic question often graces the minds and hearts of both masculine and feminine -beings upon this glorious Earth Plane Experience, as it is often the way in which one determines their own value. When will I meet my Soul Mate? What do I have to do to prepare for this union? Beloved Ones, the answer is that with every breath and choice that you make, you ARE preparing to receive a union of like vibration. There was a time when the most prevalent word on romance-seeking lips was Soul Mate. It seemed that many heart seekers were asking for their Soul Mate to appear. This was true until the Twin Flame Union was introduced and then it was almost as if the allure of having a soul mate union began to wane; as the many became less interested in the necessary and beautiful journey with a Mate of the Soul or great teacher, and wanted to skip straight to the Twin Flame Union. The question then became: Where is my twin flame? When will I meet my Twin? Why is it that what I truly wish for in my life is love and yet, it seems as though it is the last thing that I have been able to find? In this wisdom sharing, you shall learn to deeper appreciation and innerstanding both the Ego Identification with these questions and the answers themselves. It is first important to innerstand that when one IS love, which you already ARE: one feels neither need, not desire to seek love. For, how can one seek something that you already possess in the complete quantity? In the older paradigm or reality that we are collapsing consciously and strategically, it was once a truism that all twin flame unions would only come together in their last lives and for the purpose of planetary service. In this reality, the Twin Flame union was quite rare and thus, many were unable to join with the twin flame union as the grand expression of this powerful flame is the most challenging of all unions and therefore most blissful once the testing stages have been completed. This was neither a given nor a right, this was a grace once the light at the end of the tunnel was reached. What this means is that this grand unification and grand expansion would bring you to newer and more elevated Heights and thus, it was a matter of earning this gift through conscious work of great introspection along the holy journey to self-love. With great joy and bliss as WE, the Divine Twin Rays unite the blessing that occurs after twin Flames Ascend, this gateway and anchoring of Divine Union into the grids of the Earth is now in its occurrence for Twin Flames who have done the internal work to emerge. Due to this union, It has come in alignment that divine union’s upon the planet will soon be able to unite with much more ease and grace. As you know that like vibration attracts like vibration and that the frequency of what you are calling in must match your current field expression, state of consciousness, thought forms, belief systems, judgments, projections and identifications. We lovingly invite you to begin to take witness as to what it is that your thought forms project out into the world. How do they inspire love in your life? Through this process of internal transformation, this is how you will prepare yourself for this Grand Union that will now be in allowance for all who are truly ready to receive.